Franchise Direct Reviews – Scam or Legit Business Opportunity Resource? and home cleaning to automotive repair and fast food... a franchise provides a foundation, an anchor to something that has already worked. Is Franchise Direct a Scam? Please note, I am not affiliated with Franchise Direct. This review has been researched with information and testimonials that are available online in the public domain. Any conclusions drawn by myself are opinions. 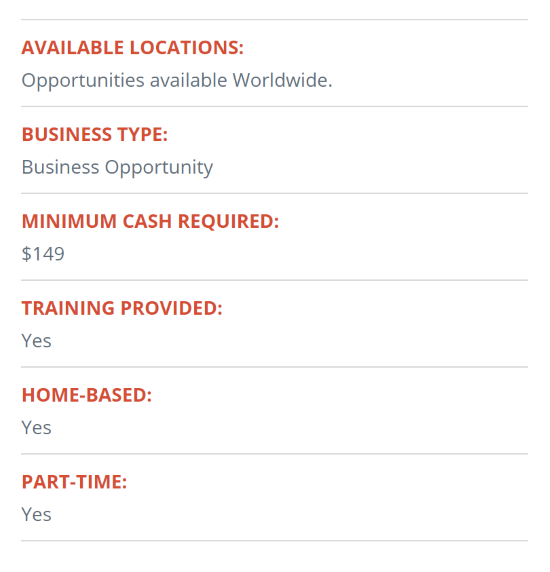 Franchise Direct connects entrepreneurs with franchise opportunities that range from low cost work-at-home businesses like Social Owl, to the big brands you're familiar with like Subway, Sonic and Rocky Mountain Chocolate Factory. Founded in 1998 and located in Atlanta GA, Franchise Direct serves markets in North America, Europe, Latin America, Africa and Asia. They claim to be the leading online source for franchise opportunities and I have no reason to doubt them. With a mountain of resources and an endless list of franchisors, they may be the most complete directory you'll find. There's nothing I could find about Franchise Direct that would suggest they're a scam. When doing research about the most common questions people are asking though... are they a scam is one of them. It's a fair question... when it comes to anything online, especially "opportunities"... people have a good reason to be suspicious. There's a lot of scams out there. Another reason people may have heard bad things about Franchise Direct is probably not because of them specifically, but because of bad experience someone had with one of the franchisors they deal with. With thousands of businesses listed across 25 - 30 categories that include just about everything from Accounting and Automotive to Fitness, Travel, Consulting, Coffee, Work-at-Home and many others... there are countless chances for someone to get burned, lose money, and call it a scam. But most people understand the risks of starting a business, and although Franchise Direct provides a ton of resources to help you, they can't (and wouldn't) guarantee success. Franchise Direct provides a lot of resources such as success stories, small business advice, and industry news... but they are primarily a directory. You can search by Industry, Investment, and Location. All relevant information to help you narrow down your options is provided such as company/franchise description (which can be a little "salesy" depending on the opportunity you're looking at), what they can do for you like training and support, as well as industry information and potential. There's a also some quick bullet points for an overview of locations, cash required, etc. When you've decided on a franchise (or a few franchises) that interest you, there's a quick contact form you need to fill out for more information. How Does Franchise Direct Get Paid? I couldn't find any specific details about how Franchise Direct generates revenue... other than advertising. And, if the difference between actual traffic, and traffic estimated by those tools is similar to the difference I see on my own site... their numbers would be significantly higher than that. So... for business owners selling franchises (especially if you're not a big brand name) you definitely want your business listed on Franchise Direct's website. What I don't know is whether those businesses pay a regular fee... or if Franchise Direct earns a small percentage of the royalties paid by the franchisee to the franchisor... but in either case, there are no costs or membership fees to use their directory. But to be honest... the only reviews I could find were positive from people who were happy they escaped their jobs and broke the cycle of working for someone else. Massive list of business opportunities from part-time work-at-home jobs to big brands like Midas, Tony Roma's, and SuperCuts. Clean and easy to use website with a simple interface. Much more than a directory, Franchise Direct has tons of resources including success stories, articles, blogs, industry news, reports, and events as well as a YouTube channel with a seemingly endless list of videos. There's not much to NOT like. If I had to add a few points here they'd be about franchises in general... which have their own list of pros of cons. There are some low cost opportunities here, but in general, most are in the 10K+ range and out of reach for most people who are looking for an additional stream of income. It doesn't need to be mentioned because it applies to any business (as well as college and university if we're looking at the big picture)... but of course, there are no guarantees of success and the potential exists to lose a lot of money. The good thing about buying a franchise is you're getting a business-in-a-box... a plug and play system that doesn't require you to reinvent the wheel. This is where a good side hustle comes in. It can provide the added income you need to save for something bigger and help you develop an entrepreneurial mindset. In fact, a lot of successful online business owners invest in traditional franchises. The internet is still new, and while most changes have been good for entrepreneurs, a traditional franchise provides some long-term income security. You can check out Franchise Direct here. I hope my review has been helpful and if you have any comments, questions, or experience with Franchise Direct, please share in the comments section below.